Compiling a list of the greatest college football coaches in the history of the sport is an arduous task. There are many directions one can go. For comparison purposes, this ranking only includes coaches who have presided over major college programs, so coaching greats like John Gagliardi and Eddie Robinson did not make the cut. Without further ado, let’s dive into the list. Here is the definitive ranking of the top 25 coaches in college football history (until Nick Saban or Urban Meyer wins another title). Spurrier, who won the 1966 Heisman Trophy as a Florida Gator, was not only a great coach, but also one of the profession’s best characters. The “Head Ball Coach” turned his alma mater into a national power during his 12-year tenure, winning one national championship and six SEC titles. His Gators nearly pulled off consecutive national titles, falling just short in the 1995 season. His “Fun ‘n’ Gun” passing offense was revolutionary at the time for the SEC and it certainly showed on the scoreboard. In 26 seasons at Duke, Florida and South Carolina, Spurrier posted a 228-89-2 record. Vaught, an All-American guard for TCU, coached Ole Miss to three national championships and six SEC conference titles. From 1957-63, the Rebels claimed seven straight top-11 finishes. Under Vaught, Ole Miss played in eight Sugar Bowls, two Cotton Bowls and claimed 10 top-10 finishes. Bear Bryant (7-6-1) and Bob Neyland (3-2) are the only two coaches who own winning records against Vaught. He is the only coach in Ole Miss’ history to win an SEC title and his 190 wins are the most in school history. Bear Bryant made Alabama elite, but Wallace Wade gave the Crimson Tide their first taste of big-time success. Although Wallace only spent eight seasons as the Bama head coach, he became an instant legend with three national championship victories in a six-year span. The titles were the first in Alabama’s history and helped bring respectability to Southern football. Wallace left Alabama following the 1930 season for Duke, where he led the Blue Devils to six Southern conference titles before taking a leave of absence to serve in World War II. Wallace owns a 171-49-10 overall head coaching record, including a 61–13–3 record at Alabama. Blaik started his head coaching career at Dartmouth, but was most successful at Army. 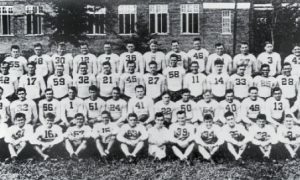 From 1944-1946, the West Point football team went 27-0-1 and claimed three national titles with Heisman winners Doc Blanchard and Glenn Davis. Blaik coached six Army teams that did not lose a game and three Heisman trophy winners (the other being Pete Dawkins). He finished his coaching career on a high note, leading Army to an 8-0-1 record and no. 3 ranking in 1958. Assistant Vince Lombardi spent five years under Blaik before enjoying a successful head coaching career of his own. A disciple of the great Woody Hayes, Schembechler is synonymous with Michigan. The face of the Wolverines brought the program back to national prominence, finishing ten consecutive seasons ranked in the top 10. His Michigan teams won or shared 13 Big Ten titles and went 5-4-1 during the “Ten Year War” against rival Hayes’ Ohio State Buckeyes. While he’s a Michigan icon, Schembechler’s lack of a national championship and 2-8 record in the Rose Bowl prevent him from joining the upper echelon of collegiate head coaches. Jones, who won three national titles as a player at Yale, led his alma mater to a championship in his second season as a head coach, but became a legend at the University of Southern California. While he also presided over two undefeated Iowa Hawkeyes teams, Jones was most successful at USC, winning four national titles. His Trojans squads went 5-0 in Rose Bowl games and claimed seven Pacific Coast conference titles. Jones’ brother Tad is also a member of the College Football Hall of Fame. Parseghian helped revive a Notre Dame program that was in a bit of a slump. The Irish nearly won the national title in his first season (1964), but claim championships under Pareseghian in 1966 and 1973. All 11 of Parseghian’s Notre Dame teams finished 14th or higher in the national rankings and seven of those teams finished in the top five. The Irish lost just 17 games in his 11 seasons. He ended his coaching career in 1974 with an .836 winning percentage and transitioned into broadcasting. Royal starred at Oklahoma — but led the rival Texas Longhorns to the promised land. Royal became a head coach at just 30 years old for Mississippi State and took over at Texas three years later. Once in Austin, Royal flourished. As the face of the Longhorns, Royal coached 10 top-10 teams, 11 Southwest Conference champions and 3 national champions. Texas never finished with a losing record under Royal, who boasts a 167–47–5 record as the Longhorns head coach. The “Father of American Football”, Camp is credited with three national championships despite coaching just eight seasons. His success as a coach pales in comparison to his contributions to the sport, however. The Connecticut native and former Yale halfback is credited with the system of downs, the two-point “safety” and changing the rugby-style contested scrimmage with the uncontested line of scrimmage. Camp also popularized postseason “All-American” teams. McKay’s 16-year tenure as the head coach at the University of Southern California helped turn it into the elite program it is today. Prior to his arrival, USC had not won a national title since the introduction of the AP Poll in 1936, but captured four from 1962 through 1974. His I-formation offense helped unleash O.J. Simpson and Mike Garrett, both of whom won the Heisman. McKay also coached in the NFL, turning the expansion Tampa Bay Buccaneers into a division winner by their fourth season. Neyland’s 21-year stint as the head coach of Tennessee was broken up by military service, but he never lost his touch. In his first seven seasons, the Volunteers lost just two games. The great defensive mind brought a national title to Knoxville in 1938 and three more in 1940, 1950 and 1951. Under Neyland, the Volunteers had five undefeated seasons and earned the record for most consecutive quarters (71) holding opponents scoreless in regular-season games. Neyland’s .821 winning percentage is impressive considering he coached for 20 seasons over a 27-year span. Warner was one of the most innovate football minds of his time, with the single and double-wing formations among his inventions. The New York native coached at seven different programs, including Pittsburgh and Stanford, where he won four combined national championships. He also served as the head coach at two institutions simultaneously, handling Iowa State in the preseason and Georgia during the regular season. Warner finished with a career record of 319–106–32, but his contributions to the sport go far beyond victories. Without his innovative mind and desire to spread football across the country, the game would not be what it is today. Meyer has been a winner at every stop, with winning records at Bowling Green (17-6), Utah (22-2), Florida (65-15) and Ohio State (83-9) to his credit. His 2004 Utes team went undefeated and won the Fiesta Bowl behind future No. 1 overall NFL draft pick Alex Smith. His 2006, 2008 and 2009 Gators squads all went 13-1, winning three SEC titles and two national championships behind Heisman winner Tim Tebow. Meyer took over at Ohio State in 2012 and revitalized the Buckeyes brand, winning the inaugural College Football Playoff championship. His 2012 OSU team went undefeated in the regular season, but was ineligible for the postseason due to previous NCAA sanctions. 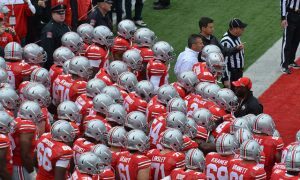 With three national titles and a combined 186-32 record, Meyer has been one of the dominating coaching forces of his era and still has time to rise up these rankings. He retired for the second time after the 2018 season. Bowden started his head coaching career at South Georgia State and later moved on to Samford, West Virginia and Florida State, where he coached from 1976 through 2009. Although 14 of Bowden’s wins were vacated due to an academic scandal, he still remains second all-time in career wins at a major college program with 357. His illustrious tenure as the Seminoles head coach included 2 national championships, 12 ACC titles and 24 consensus All-Americans. He led the Seminoles to 18 seasons with ten or more victories, highlighted by a remarkable stretch of fourteen consecutive from 1987 through 2000. A former Minnesota halfback, Bierman returned to his alma mater in 1932 and directed the program through its most successful stint in school history. Under Bierman, the Golden Gophers won seven Big Ten titles in a ten-year span and five national championships in eight years. That stretch of dominance is one of the greatest feats in college football coaching history. He also won three conference titles at Tulane. The transition from the college coaching ranks to the NFL has not been kind to many who have tried their luck, which makes Switzer a rare breed. He is one of just three head coaches to win a national championship and a Super Bowl, the others being Pete Carroll and Jimmy Johnson. As a college coach, Switzer was especially dominant. His Oklahoma Sooners owned the 1970s, winning consecutive national championships, and made a resurgence in the mid-1980s behind Brian Bosworth to win another title. In 12 of his 16 seasons, Switzer’s Sooners finished no worse than seventh in the national rankings. His .837 winning percentage remains one of the highest in college football history. Paterno is the winningest coach in major college football history (409 victories) for his time as the head coach at Penn State. Joe Pa owns the records for most years spent as a football coach at a single institution (62) and most years spent as the head coach at a single institution (46). During his Hall of Fame career, Paterno led the Nittany Lions to 5 undefeated seasons, 24 bowl wins, 3 Big Ten titles and 2 national championships. Although undoubtedly a coaching great, Paterno’s legacy was marred by a child abuse scandal involving his former defensive coordinator Jerry Sandusky. Wilkinson, who won three national titles as a quarterback for the University of Minnesota, took over as the head coach of Oklahoma at just 31 years old. Inexperience was not an issue, however, as Wilkinson immediately led the Sooners to a first-place conference finish. In fact, the Sooners went on to claim 13 consecutive conference titles — along with three national titles and four undefeated seasons during that span. Wilkinson’s achievements include a 47-game winning streak (the longest ever), an .826 winning percentage and 11 straight top-10 finishes. Stagg is widely regarded as one of the most important figures in college football history. His inventions include the lateral pass, reverse play, huddle and linebacker position, along with some equipment. As a coach, he amassed 314 wins, 2 national championships and seven Western/Big Ten conference titles. Four of his University of Chicago teams went undefeated, including the 1905 squad which won the first “Game of the Century” over the University of Michigan. Stagg is a member of the College Football Hall of Fame as both a player and coach. Like others on this list, Osborne’s name will be forever linked to his program. The Nebraska native turned the Cornhuskers into one of the country’s most feared squads, winning no fewer than nine games in all 25 of his seasons as head coach. Every one of those teams finished their respective seasons ranked in the top 25 and 18 of them finished in the top 10. Despite this continued excellence, Osborne’s Huskers failed to win a national title until his 22nd season — but then proceeded to win two more in the next three years. Considering the lack of history and geographical disadvantages, Osborne’s massive success (255-49-3 record) at Nebraska is remarkable. Woody Hayes is one of the most recognizable names in college football history. The Ohio native worked his way up the ladder with head coaching stints at Denison and Miami (OH) before assuming the job at Ohio State. In his 28 seasons, Hayes led the Buckeyes to 5 national championships, 13 Big Ten titles and a .761 winning percentage. His head-to-head battles with Michigan head coach Bo Schembechler, a former player and assistant under Hayes, were some of the most memorable in the sport’s history and later became known as the “Ten Year War.” His 16 wins over Michigan remain tied for the most in the rivalry’s history. Unfortunately, Woody’s illustrious career came to an unceremonious conclusion when he was dismissed for punching a Clemson player during the 1978 Gator Bowl. In just 13 seasons, Leahy won 107 games and five national championships as the head coach at Boston College and Notre Dame. From 1946 through 1949, his Fighting Irish teams did not lose a single game (46-0-2) and captured three national championships. Leahy, who also played at Notre Dame under Knute Rockne, led undefeated teams in 7 of his 13 seasons. Unfortunately, health concerns forced Leahy out of the coaching game early, but his excellence cannot be denied. Before Yost took over for Michigan in 1901, East Coast programs Harvard, Penn, Princeton and Yale claimed a share of every national championship. That season though, Yost’s Wolverines dominated, out-scoring their opponents 555-0. The “Point-a-Minute” Wolverines continued to score at breakneck speeds the next four seasons, claiming three more national titles. Yost went on to win two more national championships at Michigan and owns an .833 percent winning percentage as the U-M head coach. With a 102-12-1 record, Rockne owns the highest winning percentage for a head coach in college football history. Like Leahy, Rockne starred on the gridiron for Notre Dame as both a player and coach, earning All-America honors as an end and — depending on who you’re talking to — between three and five national titles as the Irish’s head coach. Under Rockne, Notre Dame football became a brand name, playing a national schedule that attracted new fans from all across the country. In 11 of his 13 seasons, Notre Dame finished with one or no losses. The entire college football world was dealt a major blow when Rockne tragically died in a plane crash at just 43 years old. Saban has revitalized the Alabama program since taking over as the Crimson Tide’s head coach in 2007, winning five national championships and a total of six national titles. He is the only head coach to win national titles at two FBS schools (he also won with LSU in 2003) since the introduction of the AP Poll in 1936. Saban and former Alabama head coach Bear Bryant are also the only head coaches to ever win an SEC title at two different institutions. Although his two-year stint as the head coach of the Miami Dolphins was a disappointment (15-17), with six national titles and a 232-63-1 college coaching record, Saban is undoubtedly the most dominant head coach of his era. Bryant’s head coaching career included initial stops at Maryland, Kentucky and Texas A&M, but he is best known for his excellence as the face of the Alabama Crimson Tide. 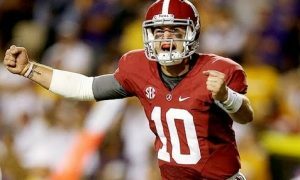 A former Bama player, “Bear” turned the Crimson Tide into a powerhouse during his 25-year tenure, winning 6 national championships and 13 SEC titles. Bryant’s 323 wins rank fourth among head coaches who presided over major college pigskin programs. His signature look, a black and white houndstooth hat, is a fashion staple at Alabama football games to this day.